Demure and unassuming much of the year, trumpet trees (Handroanthus spp., formerly known as Tabebuia spp.) stop traffic as winter closes. Native to Central and South America, these small- to medium-size beauties briefly drop their foliage and burst into unrestrained glory at the onset of spring. Gardeners in U.S. Department of Agriculture plant hardiness zones 9 through 11 enjoy stunning trumpet tree displays in exchange for minimal care. 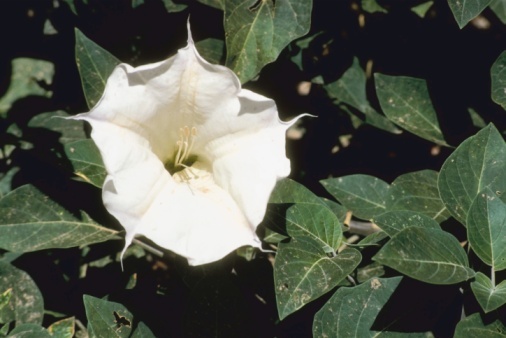 Two species of trumpet trees are most common in the United States. Whether you prefer gold or pink, their blossoms gleam against bare spring branches. Funnel-shaped blooms measuring 3 to 4 inches in length cluster at branch tips, lasting several weeks from late winter into early spring. As blooms fade, the trees' leaves unfurl. Blossoms of the pink trumpet tree (Handroanthus impetiginosus) range in color from delicate pink to magenta and lavender, often accompanied by golden-yellow throats. The golden trumpet tree's (Handroanthus chrysotrichus) golden-yellow blossoms bear maroon stripes within. The fragrant blooms open from big buds covered with rust-brown fuzz. Until 2007, trumpet trees common to the United States fell under the plant genus Tabebuia. Then distinct features landed the trees in a new category. Unlike similar trees in their old genus, common U.S. trumpet trees have hairy undersides to their leaves. Minute hairs on the pink trumpet tree are easily overlooked, but long, rusty hairs leave the undersides of golden trumpet foliage fuzzy and brown. Both pink and gold trumpet trees have palmate leaves with five to seven 2- to 4-inch-long leaflets radiating from their centers. Six- to 12-inch seedpods mature over summer and fall, persisting into winter. Both trees have attractive, ridged bark. While pink and golden trumpet trees share many characteristics, they display differences in growth. The golden trumpet tree may grow up to 36 inches per year to heights of 15 to 25 feet, spreading 10 to 25 feet wide. Dependable and uniform in growth, the golden trumpet tree varies little in shape or color. Pink trumpet trees grow up to 24 inches per year to a mature size 20 to 30 feet tall and 10 to 20 feet wide. Their spreading branches often droop toward the ground, and variations abound in color and flowering. When grown from seed, pink trumpet trees may take anywhere from three to 24 years to flower. Both pink and golden trumpet trees benefit from sites that protect their brittle branches from wind and frost. 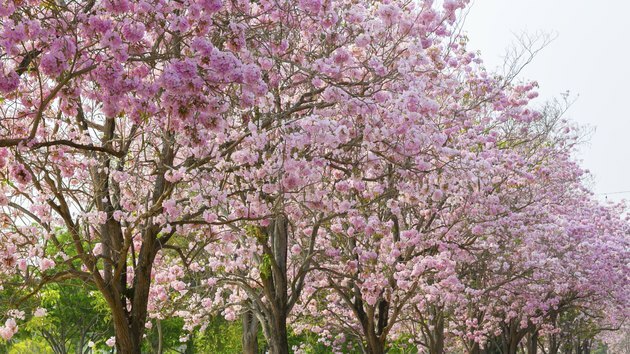 The trees tolerate light shade, but full-sun locations yield more magnificent blossoms. Reliably hardy in USDA zones 10 and 11, the pink trumpet tree prefers well-drained soil, but adapts to different soil types and pH readily. The golden trumpet tree, hardy in USDA zones 9 through 11, prefers non-clay soils and near-neutral pH. Seaside- and drought-tolerant once established, it prefers consistent moisture. Both trees do well in urban environments and don't need fertilizer or irrigation under normal soil and weather conditions. No serious pests or diseases interfere with trumpet trees and their beautiful displays. How Long Do Magnolias Bloom?